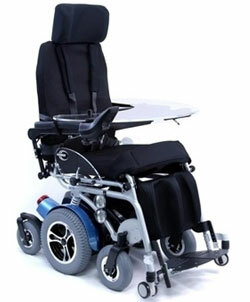 This chair is perfect for both indoor and outdoor use, the mid wheel drive allows the chair to have an improved center of gravity, while the front and rear wheels create the perfect balance for the user while engaging on changing surfaces. When it comes to standing devices, this chair is at the top of the food chain. 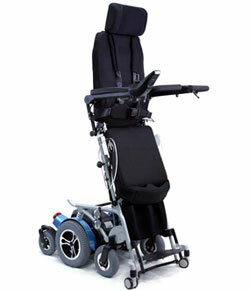 It comes standard with a mid wheel drive, full sit to stand power function, power reclining and elevating leg rest, a full control display, ergonomic leg rest support cushion, extendable arm support, full support harness, and a new power hydraulic system.